Superstorm Sandy was a reminder that the best time for severe weather preparedness is before hazards strike. Unfortunately, it also made clear that many people still lack sufficient know-how to take measures against potential loss of life and property from natural hazards. Where to get that know-how? From their kids! At least, that’s the solution developed in a new online gaming initiative—the Young Meteorologist Program (YMP)—launched during the height of this week’s storm. Children can be passionate about issues that concern them and can be effective at mobilizing the whole family and ultimately the community. Thus YMP stands out from other preparedness initiatives by recognizing children as the gateway to educating families, neighbors, and friends. YMP is an educational collaboration between the AMS Policy Program, PLAN!T NOW (a non-profit organization that assists communities at risk of disasters), the National Weather Service, and, eventually, children across the nation. PLAN!T NOW asked AMS to help create this free online resource and computer game about severe-weather science and safety. In 2010, AMS Policy Program staff connected PLAN!T NOW to disaster preparedness and response leaders. NOAA contributed considerable knowledge and support for the Young Meteorologist Program and other PLAN!T NOW initiatives. The AMS Policy Program and NOAA advised PLAN!T NOW on such topics as storm classification, tornado development, flooding and storm surges. The National Education Association also assisted to ensure the educational quality of the program. The diverse team of experts involved in YMP includes educators, scientists, entertainers and software developers, all working towards the common goal of creating disaster resilient communities across America. The joint effort culminated in YMP’s public launch on October 29, as the Eastern seaboard began to feel Sandy’s impact. The AMS Education Program has assisted in promoting the program’s availability by reaching out to its network of K-12 science teachers. YMP will be a part of classrooms, museums, libraries, major city expos and events all over the country, reaching tens of thousands of children and adults. 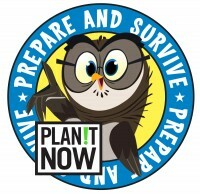 YMP also brings Owlie Skywarn – a trademarked character of NOAA, revised and updated by PLAN!T NOW – into the 21st century by making him a central character in an interactive environment online—no longer limited to printed brochures. YMP game designers began with educational material from a NOAA booklet featuring Owlie; he and a host of other animated characters help each child become a junior data collector for the game’s “Weather Center.” Game modules cover hurricanes, lightning, floods, tornadoes, and winter storms. Each game is created in full, interactive animation. Students who complete the online program earn a Young Meteorologist Certificate. Empowered by this recognition of their knowledge and effort, they are more likely to encourage parents and others to make assemble disaster kits, write emergency plans, and overall make preparedness a priority. The kids are invited to put their new knowledge to work through hands-on activities and community service projects highlighted on the program’s website. Resources for educators, parents and meteorologists to give further guidance to the Young Meteorologists are also available there. Attendees at the upcoming AMS Annual Meeting in Austin, Texas, can learn more about YMP from the expert’s perspective–NOAA’s Ron Gird and colleagues will present a poster at the Education Symposium (2:30-4 p.m.; 7 January 2013). Dan Pisut of NOAA’s Visualization Lab spoke to the AMS Broadcast Conference about YMP this past August, and that presentation can be heard on our meetings archive. Future versions of YMP may include new modules on fires and tsunamis, in addition to the five modules in the current game. Other scientific disciplines, such as oceanography and climatology could serve as the basis for programs similar to YMP down the road. Prepared communities start with prepared households. AMS and its partners are recognizing that those households might become prepared because of knowledgeable children.